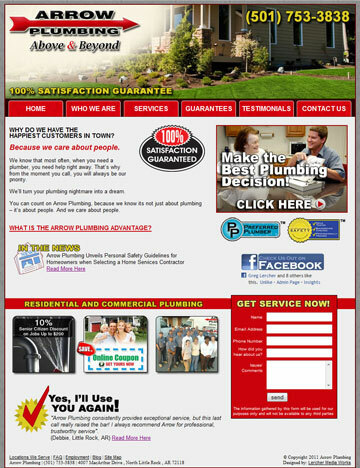 The Arrow Plumbing Website was built as a lead generation source. This website out ranks its competitors and put�s the Arrow Plumbing name on top of Google Page 1 of the search engine results. On the home page, we used several calls-to-actions by including a contact form and a testimonial check mark saying �Yes, I�ll Use You Again!� The testimonial updates with a new testimonial each time a visitor enters the site on the home page. The testimonial list pulls from the same list that is included on the actual testimonial page. For the design, we went with a simple, but attractive header picture and an easily recognized main navigation row. The header includes the main phone number and the 100% Satisfaction Guarantee. Both of these important elements are above the �fold line� in highly visible locations. "Lercher Media Works provides a great service, under the monthly maintenance program, I know that I can depend on LMW to help me right away to change and improve our site or to provide creative solutions for greater visibility."